To cook the perfect soft-boiled egg all that is needed is a saucepan, a slotted spoon, and an egg timer. Don’t cook more than 4 eggs at a time. Bring a saucepan of water to a boil, reduce the heat to simmer, gently add the eggs, and set the timer. The timer should be set for between 5 minutes and 7 minutes. If one prefers runny yolks then put 5 minutes on the timer. For firmer eggs set the timer to 7 minutes, and if cooking 3 or 4 eggs add a few seconds to the time cooking. 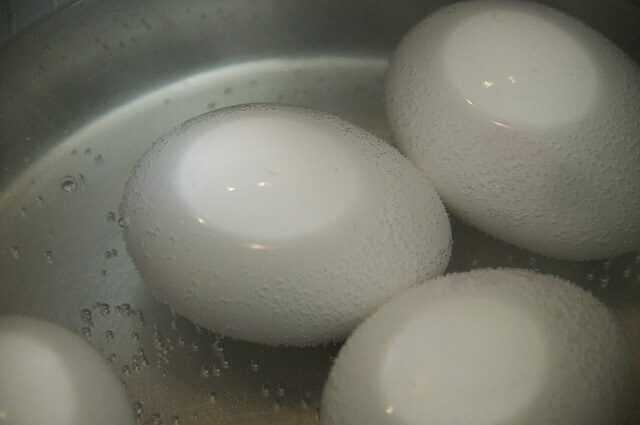 Remove the eggs and rinse in cool water for a few seconds. Crack the eggs open with a knife by tapping a small circle around the top of the egg and lifting off the top of the egg. The eggs are ready to serve and eat! They are the perfect comfort food to bring you back to childhood or just when you need something rich. Set a timer since that yolk will keep cooking if you don’t watch that clock.